For Eastern faiths, generally speaking, that sentence would be more accurately conveyed as: “Consciousness is indestructible.” Which one is correct? In The Beaten Path, I lined these two statements up against each other by describing the influence that my stepbrother Nicholas Vreeland had on me, especially during my teenage years. At the end of the book, I’m in essentially the same kind of position I was in Paradise Fever: at bay in a desolate spot out behind another house (this time a rather bigger one, in Santa Fe, New Mexico), feeling surrounded by a world that will either swallow me up or transform me. Once again, it’s a position that I, along with many other people of course, suspect our world itself is in. As our possibilities shrink around us, we find ourselves pressed to make a shift of some kind: a shift upward into a different mode of being, or a shift downward into collapse. The best single image of this situation I’ve ever seen is in James Cameron’s 1989 film The Abyss. Cameron’s films are often marred, it seems to me, by his sappy dialogue, but if you ask me he has a rather extraordinary eye for visually embodying key aspects of our modern spiritual situation. In the scene I’m thinking of, the film’s villain, played by Michael Biehn, is in a broken one-man submarine, sinking into the darkness. The deeper he goes, the more desperate he feels. He’s got light, he’s got oxygen, he’s got a control board in front of him that had, until the sub broke, given him a feeling of autonomy – a feeling of being his own boss. But with this little bubble of autonomy compromised, all is suddenly lost. As the pressure outside increases, the windows of his craft start to crack. Finally, the pressure is too great and – bam! – he’s gone. That one-man sub is, at least when I look at the scene, the submarine of our individual bodies and our individual psyches – entities that we can make a good show of things in as long as they’re working correctly, and as long as we keep out of mind the fact that they will one day stop. Who can keep it together, can remain him or herself and not fall apart, when the machinery really starts to break down? That was the kind of person that I was, in my half-baked way, searching for in The Beaten Path. I didn’t find such a person (though I found plenty of individuals who either looked or sounded like it from a distance), and that’s why The Beaten Path also has, as one of its themes, the problem of the failed wisdom master. At a point in my teenage years I began consuming wisdom books, or what I call “life manuals,” out of a vague yet firm belief that they were offering me, if I read them right, a recipe for getting through life successfully, for making sense of its many problems and paradoxes. The three major influences on me in those years – and the three authors who also come in for the most abuse in The Beaten Path – are Alan Watts, Carlos Castaneda, and Aldous Huxley. Actually, I’ve remained a fan of all three writers, and hadn’t intended, when writing the book, to come off like I was really dissing them or their messages in earnest. Each man was, however, pretty flawed, in the usual human sorts of ways, and in a sense the book is about is my coming to terms with the fact that, much as I wanted to meet a kind of “perfect” human, who I could trust to really show me what life was like and what I should do in order to live it correctly, no such being ever really appeared. That no such individual showed up on command was inconvenient, at least for me at the time, but it was never my intention, in telling my story there, of suggesting that such individuals do not exist. I very much suspect they do, and that they are by and large to be found just where the world’s wisdom traditions always suggest they are: far off the beaten track, out of the common way, and usually nowhere near, say, the New York Times Bestseller List. So is my (pretty widespread) desire for what in the book I call an “adult unlike other adults” just a quirk of my character, or is it a larger problem? One, that is, that our culture at large suffers from? Robert Bly – mostly in that stretch of his writings taken up with the (sometimes-silly-and-sometimes-useful) Men’s Movement – has often suggested that we live in a culture where the adults are missing. 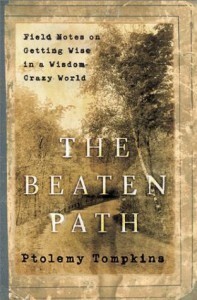 The Beaten Path is a description of what happens when someone who longs for an initiatory encounter with a genuine such adult — a human being who has been initiated into the world outside the ordinary world and returned from that place in one piece – fails to do so. What, in our culture, is such a person left with? For me, consumption of wisdom books. For others, consumption of… well, you name it. We are a buying culture, and we buy, I think, in large part out of our frustration with not being able to change and to grow. There is something we want to be. We sense it, and we look for models of it around us. And when we don’t find it, don’t find out how to actually become it instead of longing to become it, we end up as collectors and cataloguers: People who have stopped moving forward. People trapped, for better or for worse, in the ordinary world we wake up to every day. A world rich with its rewards and pleasures, but which, a secret part of us never stops tiring of whispering, is not the only world there is.